As your local dealer, we work with you every step of the way. We'll assist in the initial planning and conception all the way to follow-up care and maintenance. As shown in the picture captioned "Standard Shapes", we offer a wide range of sizes and shapes, including Rectangles, Grecians, Ls, Lazy Ls, Ovals, Kidneys, and Roman Ends. We'll help you pick the one that best fits your backyard, not only to maximize enjoyment but to increase the property value of your home as well. Stop in and browse through our complete list of pre-designed pools today to find one that you can enjoy! Have that backyard engineer feeling in you? 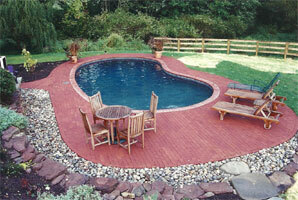 Grab a paper and pencil, draw your "blueprint" of your dream pool, and send it to us. 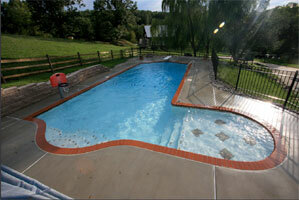 We'll work with you to develop and build your own custom-designed pool! Each design in the picture captioned "Custom-Designed" was taken from an actual blueprint! 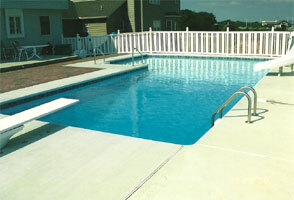 If we don't have the standard pool you are looking for, let us know what it is and we'll gladly work with you!